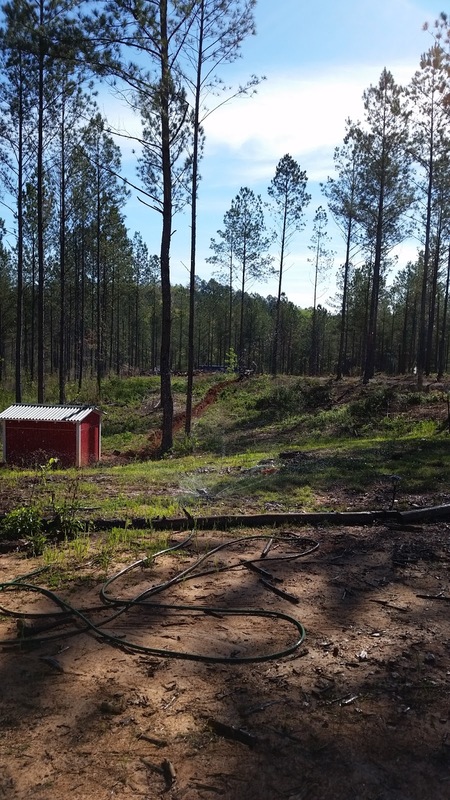 We worked so hard getting the water lines to the orchard installed and planting trees, shrubs, and grass seed last week, that we almost forgot to have fun! 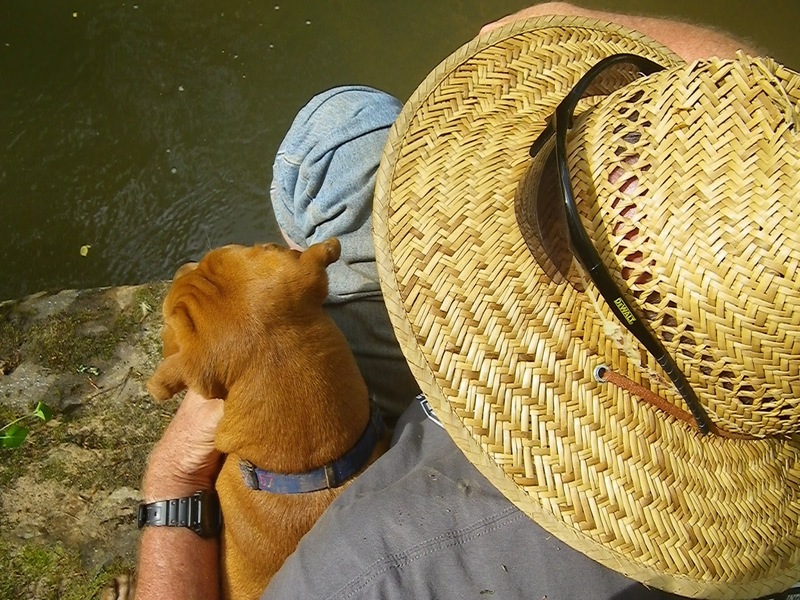 Well, we had fun working around the farm, as usual, and hubby really had fun on the backhoe, but we got to Saturday and realized we’d only been down the creek once and that was down by the bridge. 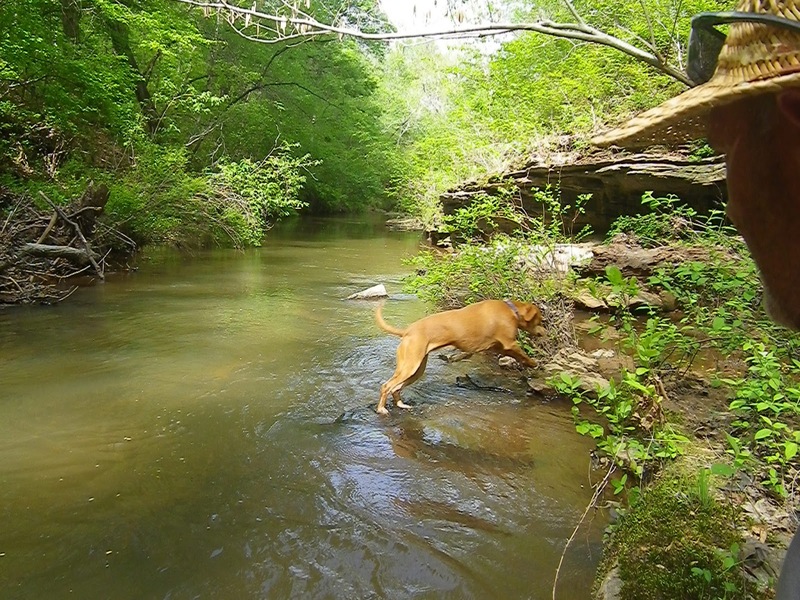 It’s pretty there, and the dog was able to cool off and wash off, but the creek area at the back of the property is so much prettier. Plus, we needed to check on a couple of trees that we’d planted along the trail that way on our last trip. Once we got down the the creek, we didn’t want to leave. Just like when we were children, we became enthralled with watching the eddies as they swirled around the rock. We laughed when Maggie stuck her head under the water and blew bubbles out of her nose as she tried (and succeeded) to get a rock. We watched bees and butterflies land in the sandy bank to get water and minerals. We sat and dreamed about the future and the live we will life in this beautiful place we own. We cooled our tired old feet in the cold water and just sat still for a while. It’s so very easy to walk five miles a day just going about our daily business. Since we’ve been back, my fitness tracker has been fussing at me because my average steps per day are so much lower and I wish I could just tell it that I’m doing a different kind of work now and walking is less fun in dress shoes! We returned home to find healthy, humming, hives with lots of nectar. The hive with the second swarm we caught this spring had two queens in it, so we had an extra to put into one of the new splits that had an open queen cell, but no queen. The other split has a queen, but we didn’t see any larva on Monday. It’s supposed to storm this afternoon, so we’ll probably check again tomorrow after work. Maggie clearly still wishes she had 22 acres and a creek to play in. There’s only so much energy she can burn off in the fenced in portion of our 1/3 acre lot and our resident mockingbird appears to be making her life a misery, much like it has done for all our pets for the past 15 years. I know it is probably not the same bird, but the mockingbirds and bluejays love to dive-bomb the dogs, cats, and occasionally us. So now Maggie gets to sit on the couch and watch me grade another batch of essays. IB and AP exams start in just over a week, so this is my second-to-last batch of the year other than optional revisions that students will turn in over the next couple of weeks. I see both daylight at the end of the tunnel and the fruits of my labors as some of my weakest students are now writing good, analytical essays. Just like raking clay back into a 600 foot long trench becomes tedious after the first hour or so, it, and these final essays, leave me feeling that every bit of effort I put in is well worth it. These bees were quite cooperative. Hubby scooped a couple of handfuls into a NUC, I squirted some Honey B Healthy onto the inner cover, we gave them a stick to use as a bridge and they pagenented right on in. 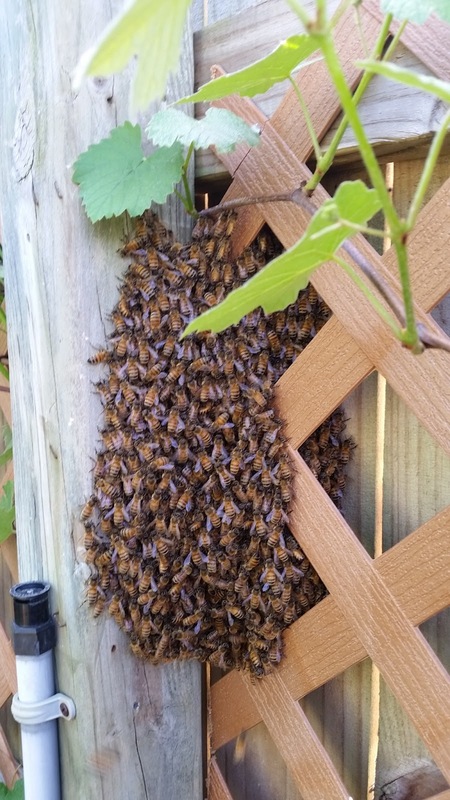 By the time we’d checked the other hives, only two lost bees were still wandering around on the fence. One of our other splits now has the fattest queen I have ever seen, so that NUC made the trip to the farm and the bees are already bringing in loads of white pollen. We moved them up to an 8-frame so that they could get over all of their confusion about the new location at once and they seem to be as happy as clams. The queen cells in the sister NUC have hatched, but we didn’t see a queen. Hopefully she will find her way home in a couple of days. The other hives at the farm are all active, but we didn’t check them today. Hubby is digging more tenches for water lines and I planted some tomatoes and thyme. We are really curious to see whether the diatomaceous-earth we sprinkled on the ground two weeks ago has had any impact on the small hive beetles. It’s supposed to kill them when they go back onto the ground to pupate. Now that the hives are stronger, we aren’t seeing as much of a problem as when we came out of that really cold snap, but we’d love to see no beetles at all. It still seems like having the hive in a sunny spot works wonders, but that is going to make hive checks challenging in July. The dog is chewing on a pine-cone, hubby is working hard, and I’m enjoying sitting out in the 72 degree sunshine. It’s amazing to sit here at this time of day and see just how many insects are flying around at any given time and at how many spider webs are catching the sunlight. Even with the sound of the Ditch Witch, the farm is so peaceful and just a good place to be. We are just so very lucky and happy to be here.